ITV would provide fewer regional programmes, including news bulletins, under proposals from regulator Ofcom. The broadcaster has been advised to concentrate on providing original output which has been made in the UK. It would be allowed to show fewer daytime news bulletins, but only after it "restructured" its news operations in England and the Scottish Borders. Ofcom has been looking at the future of public service broadcasting at a time when advertising income is falling. The main commercial operators - ITV, Channel 4 and Five - are governed by rules on the amount of news, children's, religious and arts programmes they must broadcast. In effect, they receive a public subsidy to provide the types of shows which are less profitable, and therefore not as attractive in commercial terms. But the rules needed "a deep structural change", said the organisation's chief executive, Ed Richards. "The system where easy profits for commercial public service broadcasters effectively subsidised certain kinds of programmes has now gone. "What we are proposing is to focus on audiences' priorities - those areas that audiences most value," he told BBC Radio 4's Today programme. But there has not been universal approval of the idea that ITV would show less regional news. The broadcaster plans to cut its newsrooms around the UK from 17 to nine, and the Bectu union fears 250 jobs will be lost among journalists and technical staff. Politicians have made submissions to Ofcom over the proposed merger of the Border and Tyne Tees newsrooms, covering the south-east and south-west of Scotland, plus the north-east of England and Cumbria. There were concerns that the quality of news for the south of Scotland would fall if it lost its customised bulletins. Have your say: should regional programmes be preserved? Gerry Morrissey, Bectu's general secretary, said employees would be balloted over industrial action if Ofcom's proposals led to compulsory job cuts. "Ofcom has not fulfilled its responsibility to the viewers," he said. "They are looking after the interest of the broadcaster instead. "ITV were happy to make tens of millions of pounds with these licences over the years but are now saying they don't want to fulfil their public service responsibility any more. "They should not be given frequencies to broadcast if they do not take their public service responsibilities seriously." 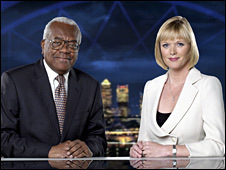 Speaking in general terms, Mr Richards said Ofcom felt peak-time news bulletins must remain on ITV as they were "the kind of news that is most watched and most valued by audiences". Ofcom has forecast that between £145 and £235 million of extra public funding will be needed by 2012 to maintain present levels of programming. The regulator also believes Channel 4 will need funding from other sources to meet its public-service commitments. This is a matter for the government to decide, but Mr Richards said Ofcom opposed "top-slicing" the licence fee, where some of the revenue generated for the BBC was redistributed to Channel 4. ITV can cut by a third the number of shows made "outside the M25"
"The budgets for the BBC's services and programmes must be protected," he said. Ofcom is trying to establish a way in which the commercial TV industry can reshape itself to address all of the issues at hand. It will continue to consult broadcasters and assess options until December, before releasing its final recommendations early next year. ITV said it welcomed Ofcom's proposals to shake up the rules covering its schedules. "We have consistently argued that the regulatory costs and commercial benefits of holding the ITV plc licences need to be rebalanced between now and analogue switch-off in 2012," it said in a statement.